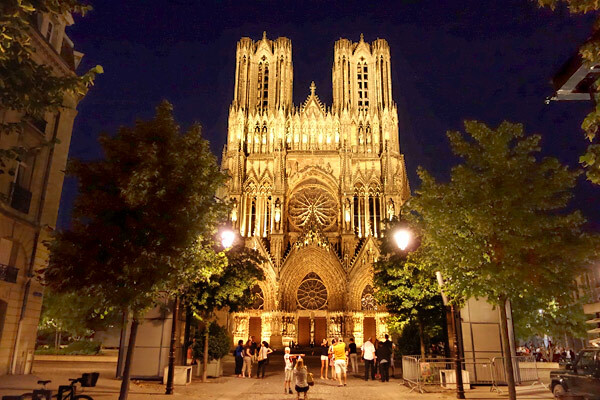 Reims, with its breathtaking Gothic cathedral and its beloved Champagne caves, is just 45 minutes from Paris on the new TGV connection. That makes it a wonderful day trip. We just reworked the Reims chapter in our France guidebook to make sure those zipping in for the day have everything they need to get the most out of their visit. My co-author, Steve Smith, and I spent a couple of nights in Reims, and our time here reminded me how important it is to enjoy modern French culture in a sizeable city that isn't Paris. 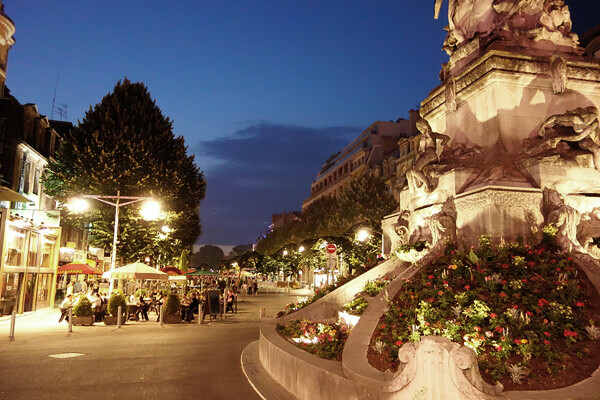 The action after dark in Reims is along Place Drouet d'Erlon. While called a "place" (square), it's really a long, wide street that's now pedestrianized and thriving with hungry and thirsty fun-seekers. Reims was the biggest city on the Western Front in World War I, and about the only thing standing in this part of town in 1918 was this fountain of the Winged Victory. As local students filled the fountain with soap, and sudsed it one time too many, the mayor decided to replace the fountain with a garden. I think it's great. Reims Cathedral is breathtakingly floodlit at night. Just marveling at it after dark reminded me how enthusiastic and expert the French are about floodlighting their great monuments. 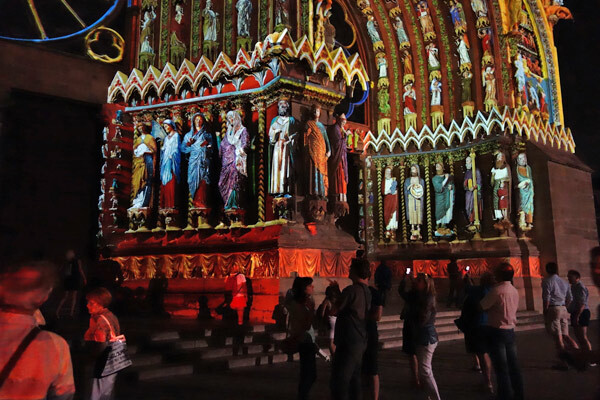 All over France, historic churches and châteaux offer "sound-and-light shows." Most are pretty sleepy and feel like entertainment from a different -- and more boring -- age. But the sound-and-light show projected on the magnificent west facade of Reims Cathedral is worth losing a little sleep over (in the summer, it doesn't get really dark at this latitude until nearly 23:00). My France guidebook co-author, Steve Smith, and I decided to check it out. So we planted ourselves on the pavement at the foot of the cathedral's towering west facade. Feeling dwarfed by it all, we gazed up at its towers. Suddenly a booming sound system kicked into gear and the stony white arches and statues came to colorful life. I struggle with the idea that Europe's wonderful Gothic church facades were boldly painted in the 13th and 14th centuries. In Reims, the sound-and-light show did a good job of helping me envision how they might have looked to a medieval peasant (perhaps on mushrooms).